When travelling, pocket devices come in handy because they perform the same functions but take up a fraction of the space in one’s luggage. For personal or business use, Toshiba offers the latest stylish pocket projectors which can project anything from songs and movies for personal enjoyment to business presentations for prospective clients. The LUMILEO P100 and LUMILEO M200 project crisp 60-inch images and feature a stylish design with a dial and a keypad. 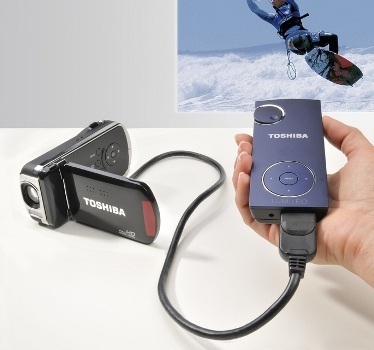 These handheld projectors can be connected to laptops, digital cameras, games consoles, smartphones, and portable media players. The projectors have a resolution of 640 x 480 with 14 lumens of light output. The energy-saving LED can project images in full brightness for up to 80 minutes before a recharge. The LUMILEO M200 has the added feature of displaying video (including DivX), Word, PowerPoint, Excel and PDF files directly from a microSD card or its 2GB of internal memory.